A couple of weeks ago I told you about my unsuccessful adventure to find and shoot some stooks. However, I always knew there would be a risk that I wouldn't find any stooks, so I made sure I had a plan B. Nothing worse than going out with the camera and not taking any photos at all! As usual, I had a look at my custom Google map to see what locations were nearby to my primary location. I quickly spotted Belstone Common on the northern edge of Dartmoor. I had marked this location as one that I needed to return to. As I hadn't been there since 2015 I thought this would be the perfect time to go. When I couldn't find any stooks I was glad that I had the foresight to think of another location. It was only another 30 minutes in the car so it wasn't long before I had parked up and started the walk up into the hills. Though I had a backup location, one thing I wasn't able to plan for was the weather. While the forecast was suited well to taking pictures of stooks, it wasn't optimal for taking big vista shots on Dartmoor. 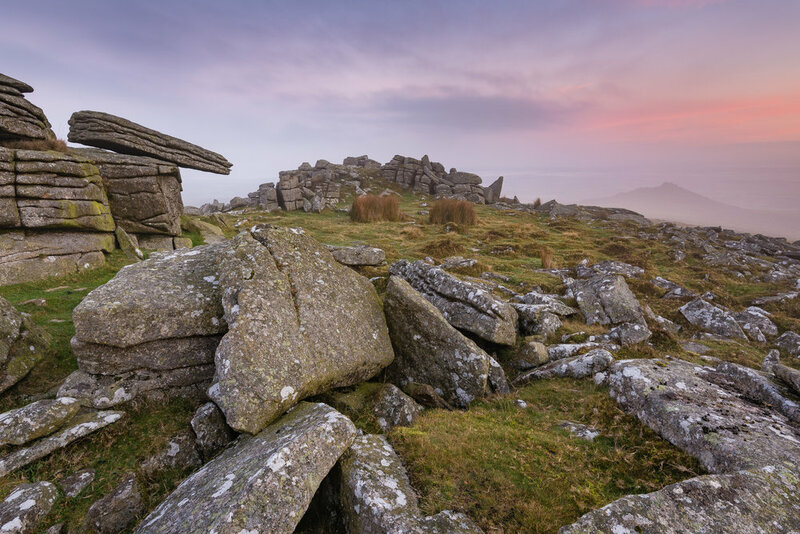 However, if there is one thing that I have learned about Dartmoor is that the weather can be very different up there on the moor (as I found out on a recent trip to Brentor Church). It's a nice walk from the car park up on to Belstone Common. If you are thinking of going yourself you should be aware that it is on a MOD firing range, so be sure to check if it is open to the public when you visit. 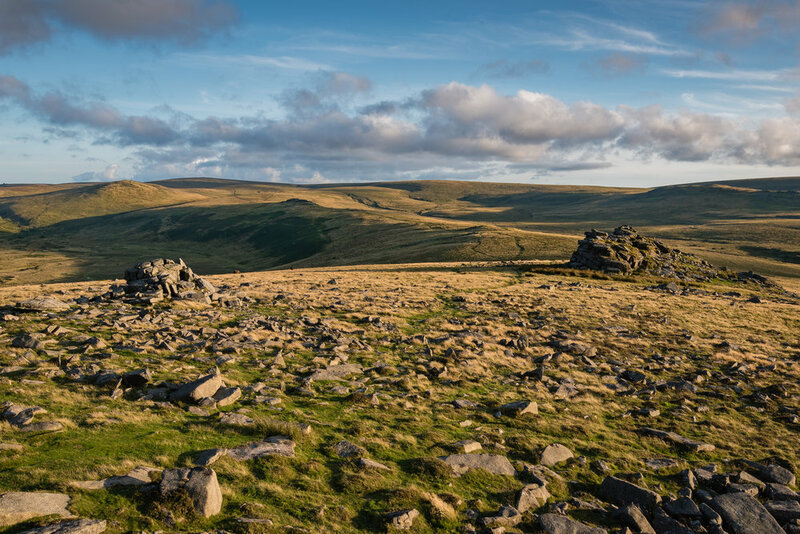 There is a lot to shoot up on Belstone and there are a number of viewpoints and tors to shoot. Though I had visited this location before, this trip was more about finding compositions for later dates. Given that the skies weren't that interesting I was happy enough just wondering about and doing some exploring. Nikon D750, Nikkor 16-35mm f/4 @ 31mm, f/13, 1/25 sec, ISO 100, Lee Filters ND grad. The first shot I took (above) was of Winter Tor and beyond. I really like this view as it gives you a nice wide view of Dartmoor as it stretches off into the distance. I took this shot around 90 mins before sunset so the light is still a bit too harsh for my liking, but in terms of a location to return to it's definitely on the list. Next time I might try it at dawn and perhaps with a longer lens. The great thing about Belstone Common is that there is so much to shoot. Unfortunately, as I arrived only a short time before sunset I did have to rush around a little. I felt there was so much more to explore. However, that gives me a great reason to return! Nikon D750, Nikkor 16-35mm f/4 @22mm, f/13, 0.6 sec, ISO 100, Lee Filters ND grad. With time running out and sunset due in 30 minutes I started my descent back to the car and to a location, I had spotted on the way up. I took the image above just before the sun went behind a cloud, killing off any hopes of a dramatic sunset. However, as with the previous image, it is a location that I will visit again. As I continued my descent back to the car I was happy with what I had captured and pleased that I had made the decision to visit Belstone Common. I would definitely be back! As I write this blog it looks like that this might well have been the last trip out with my Nikon D750. It's time to trade in for a different camera. But which one I hear you cry! Well, with any luck I'll be revealing which camera it is on next weeks blog post. So do you always head out with a plan B location? Do you do a lot of location scouting? Which camera do you think I'm getting next? Let me know in the comments below.